Praescient Analytics, a Virginia-based data technology and analysis company, has won the Thomson Reuters and CodeX 2015 Legal Tech Open Innovation Challenge, a unique open call to forward-thinking technologists and entrepreneurs to develop next-generation technology solutions to advance the legal system. Contestants were challenged to integrate years of federal court data along with outside data sources to develop an application that could create or identify useful metrics, trends, patterns, projections or predictions to support the practice and business of law. Praescient’s software engineers and data analysts utilized cutting edge machine intelligence techniques to develop their winning entry, iHammurabi. It works as a user-friendly, predictive interface that automatically analyzes numerous data points and then predicts the likelihood for success of motions to dismiss before a specific judge in federal civil court based on key factors about the case. Motions to dismiss are filed early in a case and often end them outright. iHammurabi has the potential to one day save legal professionals and their clients incredible amounts of time and money, by providing relevant predictions quickly and accurately. 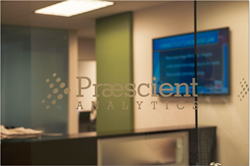 Praescient Analytics provides analytical services across the legal, commercial and government space, including its iDiscovery suite of software tools and methodologies designed to assist legal professionals in solving complex data-centric challenges. For more information about Praescient’s legal analytics capabilities, visit http://www.praescientanalytics.com/legal/. To learn more about Praescient’s products and services, visit http://www.praescientanalytics.com. To learn more about the CodeX Legal Innovation Challenge, visit here: https://www.innocentive.com/ar/challenge/9933744?cc=mktg3744&utm_source=CSmktg&utm_campaign=%209933744utm_medium=ThomsonReuters.